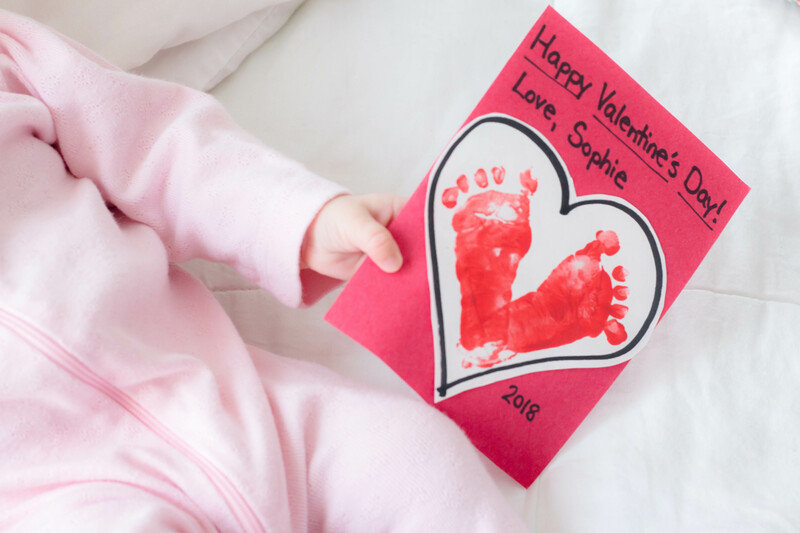 I’m excited to share Sophie’s valentine craft with you today! 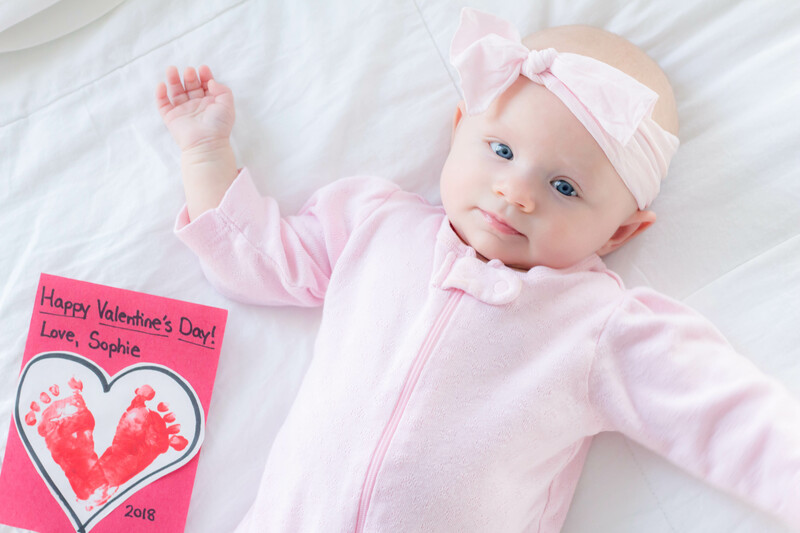 You can bet that I’m taking advantage of major holidays when it comes to baby crafts around here! 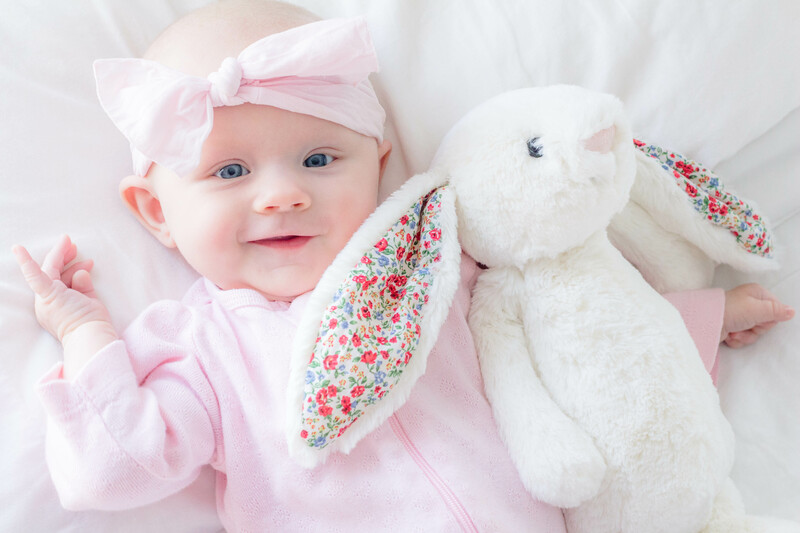 😉 There are just too many cute ideas. I’ll format this post just like the Mistletoes Christmas craft post, so you can see the materials I gathered and what our process was! For this craft, I used cheap paint from a craft store, and construction paper we already had around the house! Since we were dealing with wet paint and a wiggly baby, I like to take a few steps to combat crazy messes! I got out a cookie sheet and lined it with parchment paper. This is where I squirted the red paint and where I could spread it all out. I also got a paper towel pretty damp and set it in a small bowl. I wanted to have this on hand close by so that I could quickly wipe Sophie’s painted feet off! I had a roll of dry paper towels nearby as well. It’s about as simple as it seems! 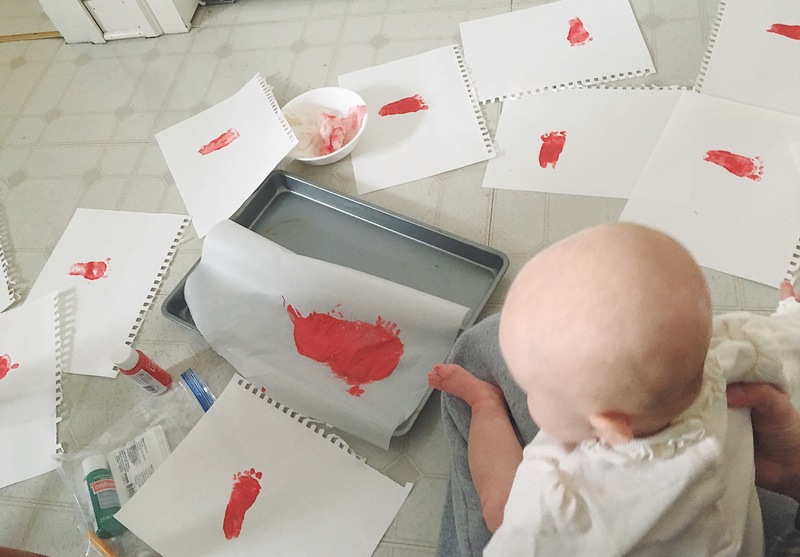 I squirted the red paint onto the parchment paper. Then I made sure I had the white sheets of paper nearby. 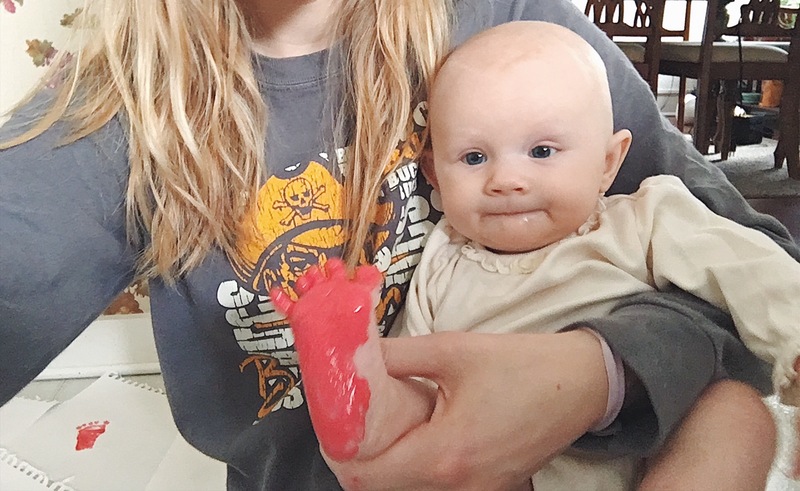 I held Sophie in my lap and stuck her foot in the paint to cover the bottom completely. I then leaned way forward and pressed her foot firmly onto the white paper. Sometimes I had to pause for a moment, with her foot still pressed on the paper, and wait for her cute little toes to relax and press themselves down firmly onto the paper! 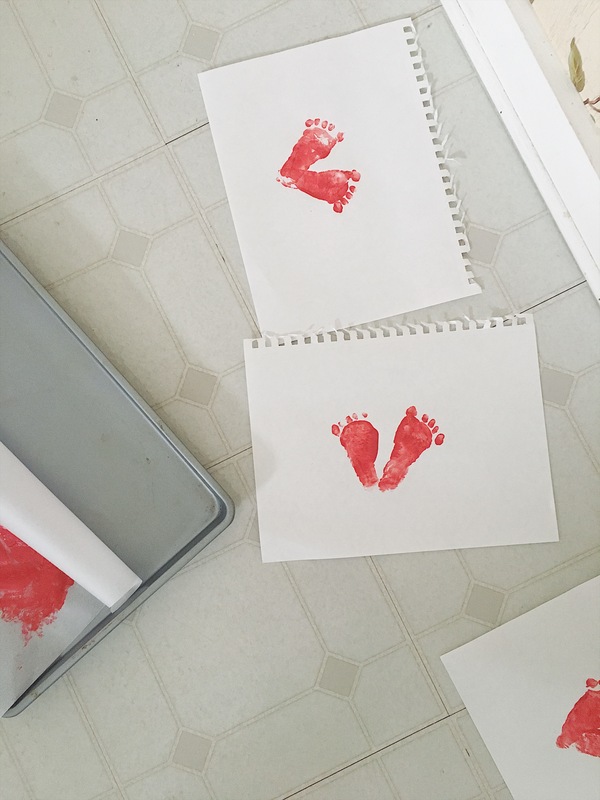 We pressed her foot onto all the white sheets of paper I had out, assembly line style. 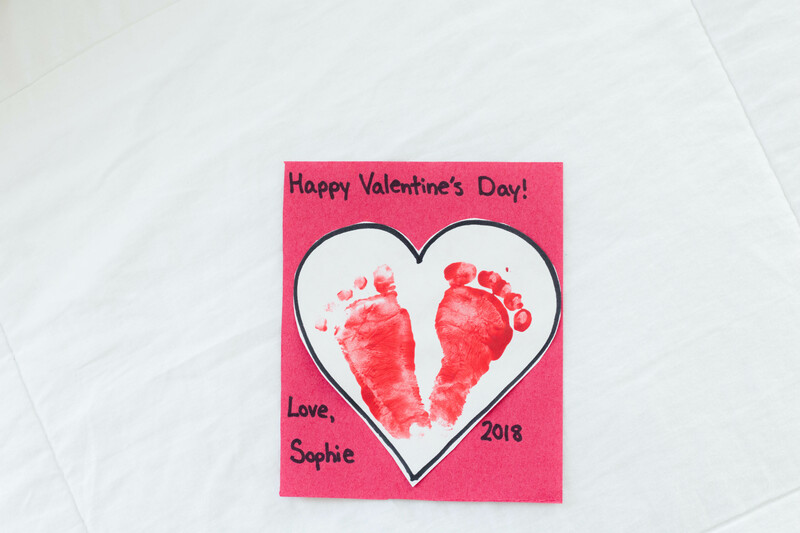 I could usually get a couple sheets stamped with her footprint before needing to cover that foot with more paint again. I just kept going with her until I could tell it was time to take a break. I quickly wiped that foot off, using the damp paper towel in the small bowl. 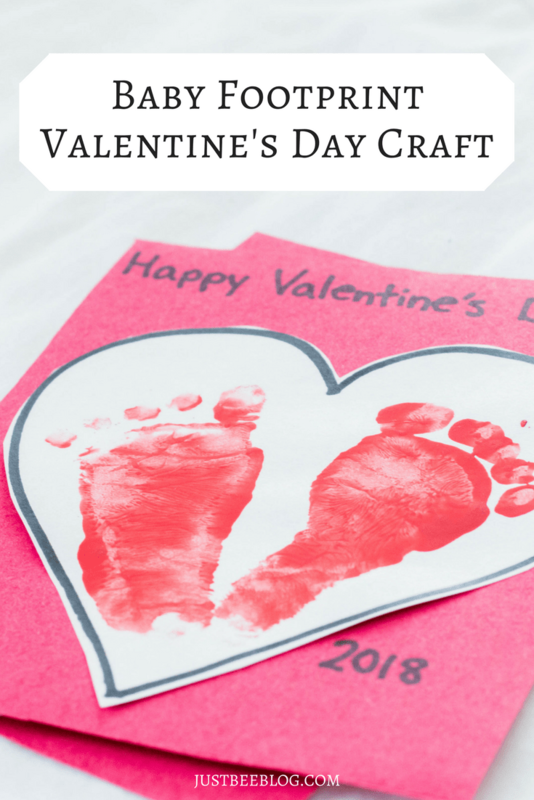 These didn’t all turn out totally perfectly – we’ve got some smeared toes, some light heel marks, and so on – but I wasn’t going to be a perfectionist about it. Sophie and I decided it’s the thought that counts. 😉 They’re still cute, even if we didn’t end up with perfect footprints every time! Later that afternoon, once the footprints were all dry, I drew a heart outline around each set of footprints and cut that out. I then affixed the heart to a valentine-sized cut piece of red construction paper using double-sided tape. 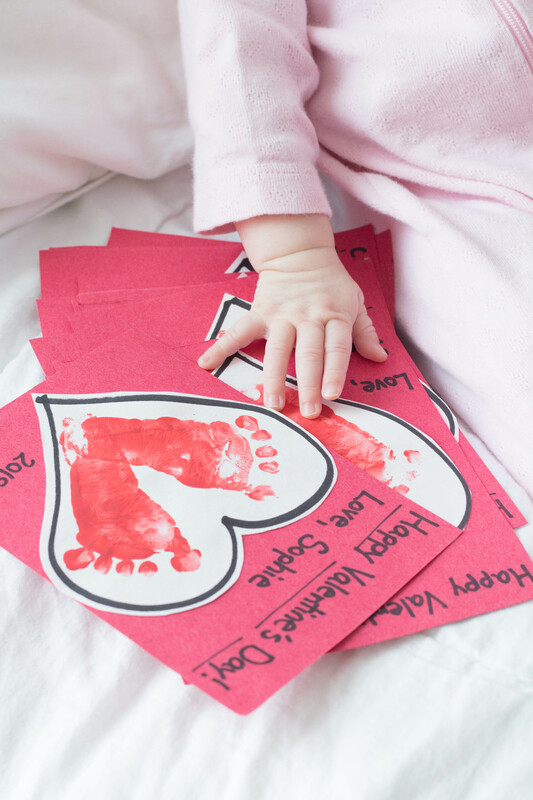 After that, the final step was to write “Happy Valentine’s Day,” “Love, Sophie,” and “2018” on each! Do you like to make cute crafts for various holidays? What fun craft ideas do you like to make?